This is an eggstra easy, eggstra chocolatey and eggstra decadent treat. 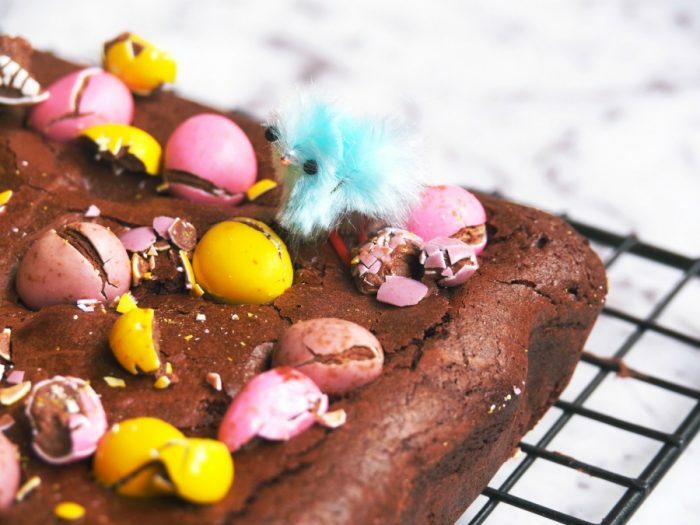 These brownies combine everything I love about Easter, Mini Eggs, Mini Chocolate Eggs and chocolate, lots and lots of chocolate! 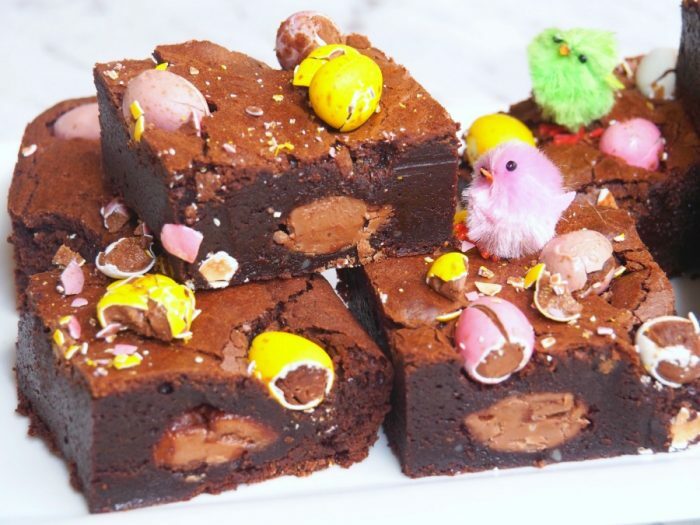 Now, I’ve used Mini Salted Caramel Eggs because I think the saltiness of the caramel cuts through the richness of the brownie nicely, but you can use whatever mini chocolate filled eggs you have to hand. Talking of eggs, do put the filled eggs of your choosing into the freezer either overnight or a few hours before baking, this will help them hold their shape during the bake. 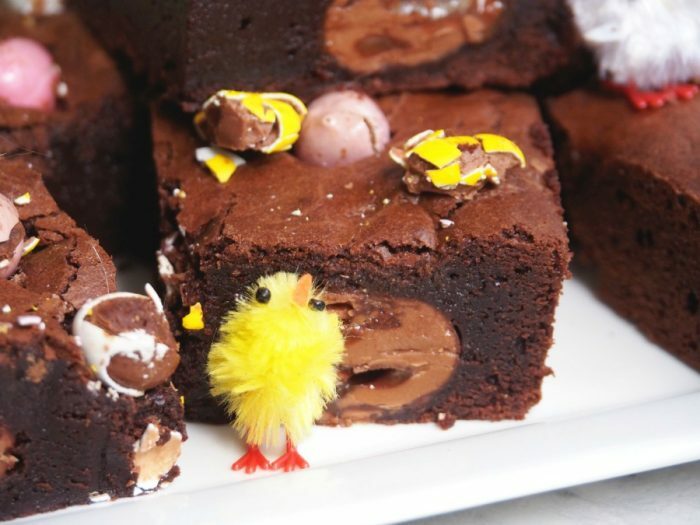 No one wants a fried egg, not in their brownie anyway! 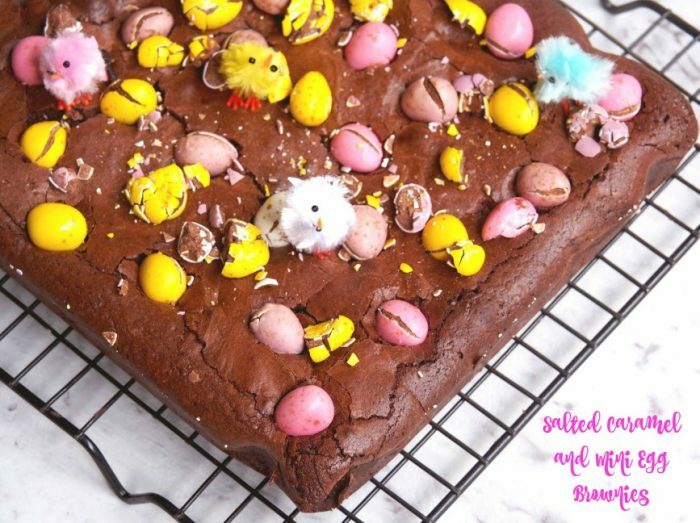 I was planning to cut these brownies into 16 pieces (working on the premise less is more,) with one chocolate egg in every piece but when I opened the packet of Mini Salted Caramel eggs, there were only 11, and that was without me even testing one! What a weird number! It just so happened that I had one left over Mini Creme Egg so that saved the day, so I was able to cut the baked brownies into 12 squares. No one was sad about it, because we get more brownie for each bite. 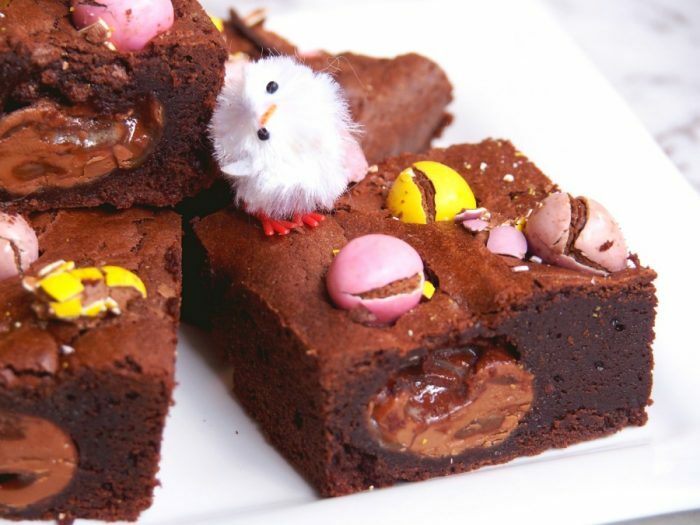 If you want to nest an egg in every square of brownie, just be sure to get 2 x 130g bags of mini chocolate eggs. That way you will have enough for the brownies and plenty to ‘taste test’ too. Win, win! What do you love most about Easter? What are your favourite kind of mini eggs? Preheat oven to 180 C / 160C fan-forced. Grease a 20cm square tin and line with baking paper, extending the paper a few centimetres over the sides to form handles. This will make it easy to remove the brownies from the tin later. Take a quarter of the speckled mini eggs and place in a ziploc bag. Using a rolling pin, bash the bag and crush the mini eggs until they are cracked into various sized pieces. Set aside. Break the chocolate into chunks and place in a pan with the butter and sugar. Melt over a low heat. When completely melted, remove from the heat and allow to cool slightly. Place about a third of the mixture into the prepared tin, just so there’s enough to cover the base. Place your caramel eggs in four rows of three (or four rows of four if you want 16 squares,) you want to guarantee an egg in each and every bite! Top with the remaining brownie batter and bake for about 20 minutes. 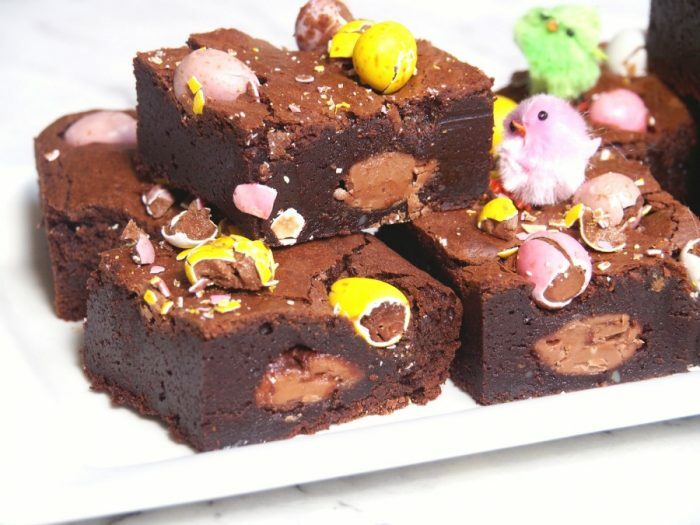 After 20 minutes, remove from the oven and gently place the whole mini eggs over the brownie batter. Return to the oven for another 10 minutes. The brownies will be done when the edges are pulling away from the side of the pan and the top is starting to crack Don’t be tempted to overcook the brownie! Remove from the oven and sprinkle over the crushed mini eggs. Leave to cool completely and then place in the fridge to chill for at least an hour. Lift out of the tray using the paper handles, and cut into 12 squares. Break the chocolate into chunks and place in TM bowl. Add sugar and butter and melt at 60C for 3-5 minutes on speed 2 or until completely melted. Allow to cool for a few minutes. Add eggs and mix for 5 seconds on speed 4. Add flour and cocoa and mix for 5 seconds on speed 4. Scrape down sides and base of bowl and mix again for another 5 seconds on speed 4. 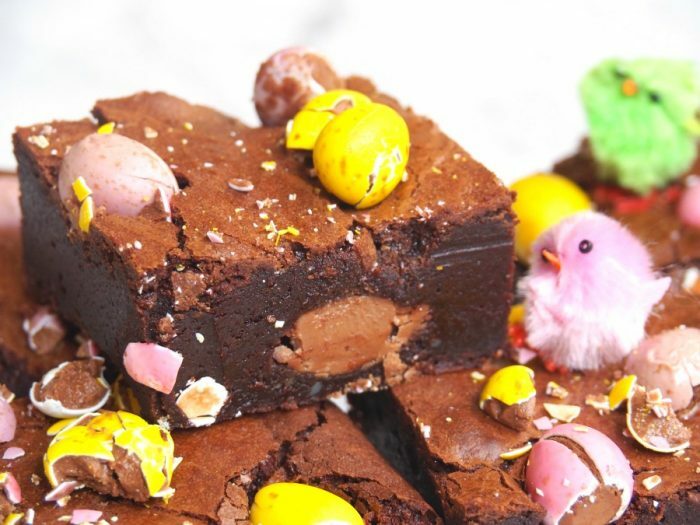 After 20 minutes, remove from the oven and gently place the whole mini eggs over the brownie batter. Return to the oven for another 10 minutes. The brownies will be done when the edges are pulling away from the side of the pan and the top is starting to crack. Don’t be tempted to overcook the brownie!